A festival of colours and love – Holi is a festival that is not missed by most Indians. A celebration that is also not missed out by brands as it provides them the right occasion to strike an emotional chord with fans. So I did a quick search on Facebook to find out which brands are doing more than just posting status messages to wish on this occasion. I have been able to pull out 8 such brands that have shown the intent to create fun and engagement on their respective Facebook pages, and these have been listed below in no ranking order. Kansai Nerolac Paints Ltd, the second largest coating company in India has been quite upbeat with the celebrations around Holi. The brand has been sharing some interesting content related to the festival of colours on its Facebook page. Furthermore, it has also created a Facebook app to up the ante. Nerolac Colour Splash, the Facebook app is an exclusive one created for its Facebook community of more than 423K fans. If you want to greet your friends in a cool way on Facebook, then you will need to like the page before you can proceed. After the authentication process, you are requested to select your friend whom you would like to send a message to. Selecting friend becomes easy when you have too many friends on Facebook due to the efficient search. The next step is selecting a picture that you can do from your friend’s album or upload from your end. Finally you are provided with different options by which you can spread colours on the picture. You can splash some colours or burst colourful balloons as per your wish. Once you are done you can add a message and share it on your Facebook wall or on your friend’s Facebook wall. The app does the job with interesting ways of splashing colors but you don’t have an edit option while you are playing with colors. Nevertheless, great way to greet your friend on Holi and if you are lucky you can grab gift hampers, courtesy Nerolac Paints. 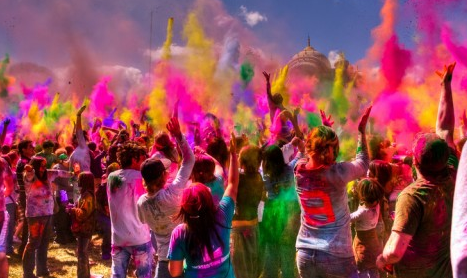 Asian Paints, India’s largest paint company has organized a Holi party for its 85K fans on Facebook. Holi On The House, a fun contest has been up for more than a week and will go on till the end of this month. The exclusive Facebook app works once you have liked the page. The app loads and before you could join the party, you need to select a colour and a minimum of three friends from your Facebook. The chosen colour will blink before you on a pixel page and you have to select. Be quick and select only your colour to win some exciting goodies. You can play again but remember every time you play you have to tag a set of three new friends. The app is interesting and addictive too since it smartly displays how many gifts are still to be won. A clever way to attract fans to play more tagging a new set of friends and spreading it further. Additionally, with cool gifts Asian Paints has created a great Holi bash on the page. General Motors that offers products under the Chevrolet brand has not missed out the occasion. The Chevrolet India Facebook page has created an app to celebrate the occasion with its more than 316K fans. Chevrolet Rang De Facebook app is another exclusive app for its fans that gives you a chance to play Holi virtually with your friends. The app pulls out your friends and you will need to select them to apply colour on them. You have a set of options by which you can apply different colours. Once you are happy you can share the picture on your wall along with your friend. The app is similar to the app created by Nerolac Paints India but the execution is better by Chevrolet. You have more options and you can edit it if you are not happy with the colours. A common way to celebrate Holi but fans wouldn’t mind playing some virtual Holi. Max Life Insurance, the largest non-bank private life insurer has not wasted this opportunity to connect with fans. The Facebook page that has a community of more than 286K fans, has created a Facebook app and is also conversing with its interesting content. Khushiyon Ki Holi Facebook app is another app that lets you play virtual Holi with your friends. You need to select your friend, apply colours on the picture selected and share it. The app is similar to the ones created by Nerolac and Chevrolet. However, the execution of the app fails to impress as it goes into a never ending loop after selecting a friend. Tata Capital Limited, a customer centric one stop financial services provider, has not let the opportunity go from its hands. Seeing the festival as a great opportunity, the brand has spiked up its engagement on the Facebook page. The brand has not only driven some decent engagement with its content but has also created a Facebook app for its more than 191K fans. Holi Dare Facebook app is a simple app where you have to describe in 300 words – why Holi is the most colourful festival in India. It can’t get simpler than this, write and stand a chance to win some goodies. However, it is not clear what are the goodies, how would it be judged, etc. since the T&C link in the app fails to work. Furthermore the page is also running another Holi contest – Splash Your Pals. The contest asks to upload your favourite Holi moments with your pals and you stand a chance to win some exciting gift vouchers too. This is an app that the brand had also executed last year for the same purpose. Wondering if the brand has run out of ideas for such occasions. Another global paint brand that has not missed out this opportunity to play with colors with their fans and have fun. Dulux Paints, which has more than 410K fans on Facebook, has created an interesting app for this occasion. Rang De Facebook app starts with a video message from the brand ambassador Farhan Akhtar. Farhan wishes all fans on the occasion and shares his childhood memories about Holi. The app then asks you to select a colour of your choice, give a wacky name to it and select a friend from Facebook. Once you have done it, the app splashes colour automatically and shares on the wall. You can do it again or share with your friends on Facebook. The app is designed well but could have given the choice of splashing colours to the fans. Nevertheless, the video message and the execution is cool. Additionally, make sure you name the colours wacky enough since you stand a chance to win goodies too. The French automaker which has a legacy with the automotive industry made sure to join the celebrations. The Facebook page which is a platform for more than 294K fans, has created an interesting Facebook app on this occasion. Renault Holify Facebook app starts with a video message embedded. The video shows a group of people playing Holi in a crazy manner. The brand asks fans if they can be crazier than this on Holi. If they can they need to upload the crazy snap along with a caption. If the snap is really crazy enough then you stand a chance to win gift hampers from the brand. The app also features the collection of snaps uploaded by fans and an invite button to invite your Facebook friends. The images are also powered by a like and share button to gain popularity. The idea of sharing wacky Holi images with a caption is not a new idea but adding the video to the app is a cool move. The naturally refreshing drink didn’t miss out this opportunity of creating some fun on the page. The Facebook page that has more than 28K fans have been creating some interesting content related to Holi. In addition to this, the brand has launched a Facebook app on this occasion. Click Karo Refresh Ho Jao Facebook app is a simple contest that believes – colourful moments could be made more refreshing. To do so a fan needs to upload the cool Holi pictures and 10 most voted pictures would win a year’s supply of Rooh Afza. The app is a simple one which requires you to upload your image, once done get your friends to vote for your picture. The app also showcases images of fans uploaded and the ones that are winning at the moment. Even though the contest idea is again a common one but the execution is good and the contest prize matches well with the brand. Apart from Asian Paints and Dulux Paints, all other campaigns created for the Holi festival were not that exciting. Nevertheless, these 8 brands tried creating some sort of fun and engagement rather than just posting ‘ Happy Holi’ wishes on the Facebook page. I am sure there might be some more brands who have tried to create some sort of creative engagement around this festival. So if you are aware of any such brand that is missing from our list then do share them in the comments.